The Explorer project is developing devices for non-invasive tissue exploration, for use in treating patients with cancer or neurodegenerative diseases. In the last twenty years, cancer care has evolved from an invasive anatomo-clinical approach to a personalized, targeted approach focused on small molecules and targeted therapy. This revolution in cancer treatment has come about thanks to access to tumor tissue, collected by surgical excision, which can be used to decipher the pathways involved in oncogenesis at molecular and cell level. However, obstacles began to appear as a result of exclusively analyzing tumor tissue. Biomedical research now emphasizes the importance of analyzing peri-tumoral tissue to gain a better understanding of phenomena such as recurrence and tumor escape, as well as to identify new treatment targets. We came up with a new concept of non-invasive tissue imprinting, which allows access to cerebral tissue and the cellular and molecular analysis of different target regions related to different brain diseases. 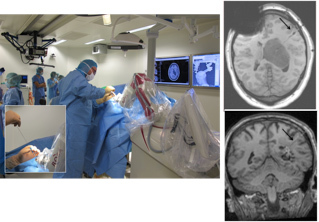 Based on surgical instruments used to implant electrodes in the brain, we have developed brain tissue imprint medical devices derived from materials used in electronics and made with chemically-modified micro-silicon or nanostructured silicon. The primary objective is to gain systematic access to the tissue surrounding the tumor during resection of the tumor. The microstructure of silicon and the addition of an “adhesive” anionic chemical reaction makes it possible to make a tissue imprint that is perfectly spatially defined. We have demonstrated that this imprint is compatible with poly-omic (proteomics, transcriptomics, next-generation sequencing) and multi-modal (molecular analysis, cell culture, on-chip immunohistochemistry) approaches. A device has been designed, produced and validated for biocompatibility and clinical operability in small and large animals (Zaccaria et al, ACS Chemical Neurosciences, 2013). The tool looks like any cerebral biopsy tool but the difference lies in the fact that silicon has been integrated into the surgical steel supports. The imprint tool is composed of three distinct elements (Figure 1). a micro-structured chemically-modified silicon chip. Once the tool has reached the area under investigation, the chip is exposed and held in contact with the cerebral tissue for 1 to 3 minutes. After taking the imprint, the chip and the tissue adhering to it are kept in the appropriate conditions for the intended analysis. Following authorization by ANSM and the Comité de Protection des Personnes (France’s ethical review board), a protocol was started on a patient in the context of glioblastoma. In terms of medical focus and industrial positioning, the idea was to develop a technology that would provide as much information as a biopsy without the same risks to the patient. It also implies having access to the region surrounding the tumor, where tumor recurrence occurs, and which contains potential targets for better treatment of this type of tumor. thereby validating the product during the pilot phase and opening it up for industrial production. The results of the clinical trial were positive, demonstrating that the technique does not have harmful effects and is effective in harvesting molecular information in humans. Thanks to the interventional nuclear magnetic resonance imaging (MRI) available at Clinatec, it was demonstrated that, unlike a biopsy (Figure 2, top MRI), the molecular imprint (bottom MRI) did not cause bleeding or lesions in the tissue. The structural and chemical modifications that can be effected on silicon give it tissue- and molecular-harvesting properties that meet current needs in clinical research, with a view to accessing the micro-environment of a tumor implicated in recurrence and which remains inaccessible using current biopsy techniques because they cause lesions. targeted therapy in cancer care, i.e. to explore the heterogeneous nature of a tumor and decipher the peritumoral micro-environment which contains therapeutic targets. understanding neurodegenerative diseases, i.e. to access the diseased cerebral tissue and its histo-molecular signature as has been possible in cancer care for the last twenty years. The review board with oversight for the pilot phase protocol has authorized us to disseminate the technology, with trials of the tool at various French hospitals: University Hospital Angers, Hôpital Henry Mondor in Créteil, Hôpital Saint Anne in Paris, and Grenoble University Hospital. This multi-center clinical trial involving 150 patients started in the first quarter of 2016. Deep brain stimulation-associated brain tissue imprints: a new in vivo approach to biological research in human Parkinson’s disease. A micro-silicon chip for in vivo cerebral imprint in monkey.